We install CCTV systems throughout West Yorkshire – and our engineers can help both commercial and residential customers. More and more people are turning to CCTV to protect their homes and businesses from crime. Regarded as the premier way of deterring potential burglars and intruders, it is a fantastic cost-effective investment that will protect your property 24 hours a day, 365 days per year. Our team of technicians are experienced and friendly, and we work with both home owners and businesses to help them protect their properties. We are happy to provide a free quotation for any type of CCTV work. Crime rates throughout West Yorkshire are fairly typical for a county that includes many large urban areas – with shoplifting, criminal damage and vehicle crime being fairly high. CCTV offers a great deterrent which often means criminals move on to a softer target – should an incident occur, then the CCTV footage can be used in a court. We provide installation of CCTV Cameras and Systems throughout West Yorkshire. Our expert team work around the county daily and we will happily provide a free quotation for any business or home within West Yorkshire for the supply and installation of CCTV and other security products. CCTV is a great way to protect your property, allowing you to both monitor and record activity. We have already supplied CCTV cameras to many homes and businesses throughout West Yorkshire. Should you be unlucky enough to have a burglar or intruder try to enter your property, thanks to the fact that CCTV cameras constantly reached, you can record the culprits red handed. Sometimes this can lead to them being caught red handed in the act but even if not, the police will find it much easier to locate them and then subsequently get a conviction. Do you ever feel a little bit anxious leaving your property when you go on holiday? Now, thanks to CCTV not only can you be thankful that most burglars will not target your house, you can actually access your CCTV cameras from anywhere in the world which means you can monitor your house remotely from abroad. Now you can have the peace of mind that your property is safe whilst relaxing on the beach. If you are a business you may be aware that more and more businesses are being sued for various slips, trips and accidents that happen on their premises. Not all of these ‘accidents’ are accidents and are done maliciously to extract money. If you have CCTV installed however, this can protect you against these sorts of malicious claims by providing vital evidence. Don’t let your property be the next crime statistic in West Yorkshire. 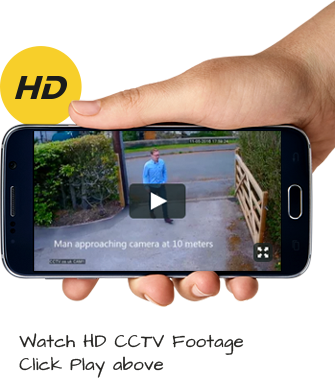 Invest in a CCTV system fitted by our experts and enjoy 24 hour protection all year round.